I know, I know…. this might sound a bit weird putting these ingredients together, but this is a great vegetarian meal. 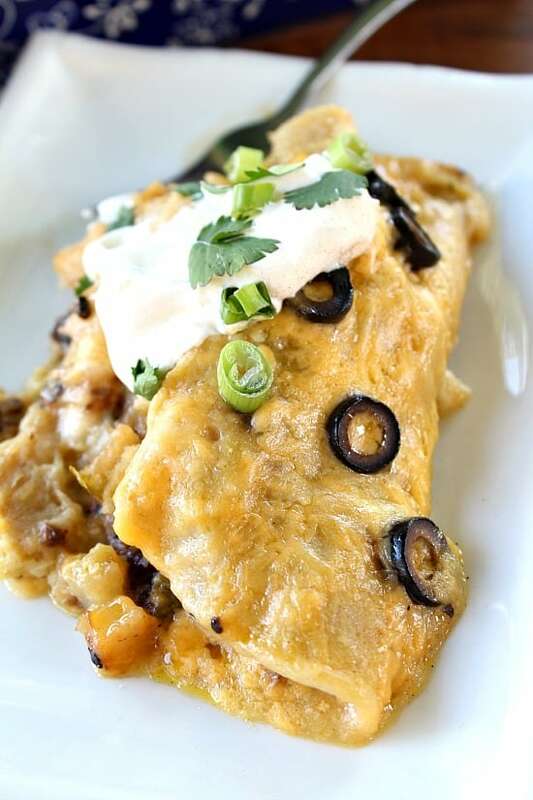 Black bean potato green chile enchiladas are tasty, filling and on the healthier side, plus this can easily be turned into a vegan recipe by using vegan cheese and omitting the sour cream, or making this without cheese all together. The corn tortillas from Trader Joe’s® are amazing!!! The corn flavor tastes so good with these, or any recipe calling for corn tortillas. There is definitely a different taste using these delicious tortillas verses the standard grocery stores corn tortillas. 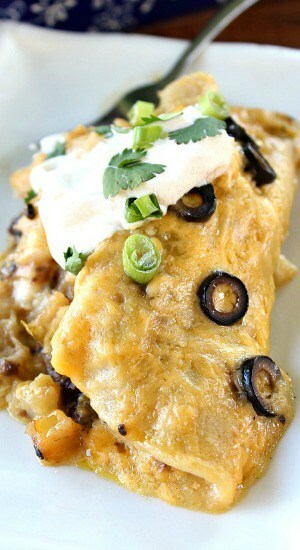 Have you made enchiladas with black beans and potatoes before? 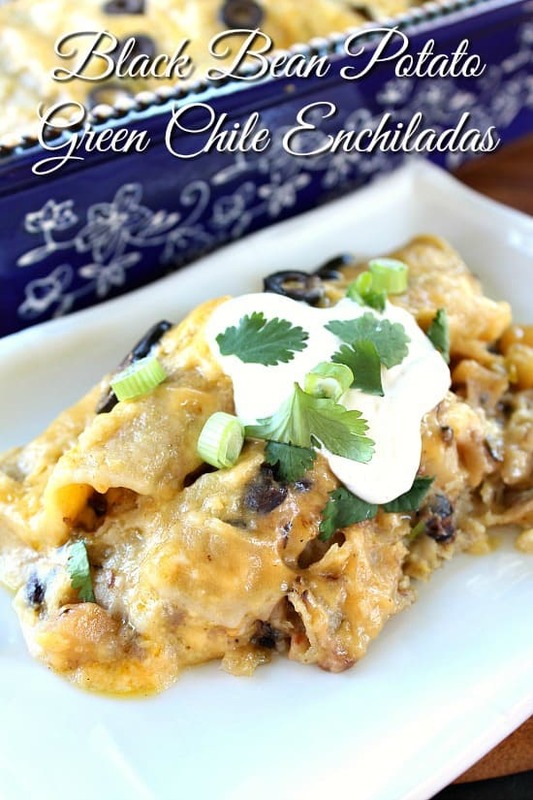 This black bean potato green chile enchiladas are definitely healthier for you. Good food can be prepared using healthy ingredients and still taste amazing! Trying to eat healthy isn’t always easy, but having tasty recipes make it a bit easier. 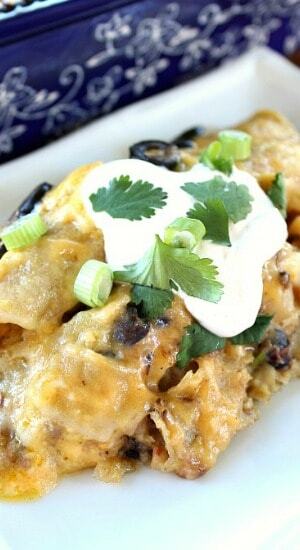 Make sure to top these black bean potato green chile enchiladas with your favorite toppings. Green onions and cilantro always make enchiladas taste a bit better! Preheat oven to 350° and spray a small oblong baking dish or an 8 x 8 baking dish with a non stick spray. Set aside. In a frying pan, heat oil over medium heat. Stir in potatoes, onions, garlic, salt and pepper. Cook potatoes until brown and crispy, add a little bit more oil if needed. Stir in black beans, diced green chilies and ¾ can of sliced olives. In a small sauce pan, heat enchilada sauce over low heat. Add a small amount of green enchilada sauce to bottom of baking dish. Heat up each corn tortilla over medium/low heat, on the burner, then add bean/potato mixture and cheese to each corn tortilla and roll up. Place each rolled tortilla in the bottom of an oblong baking dish. Continue until all the tortillas have been used (can place on top of each other in baking dish). 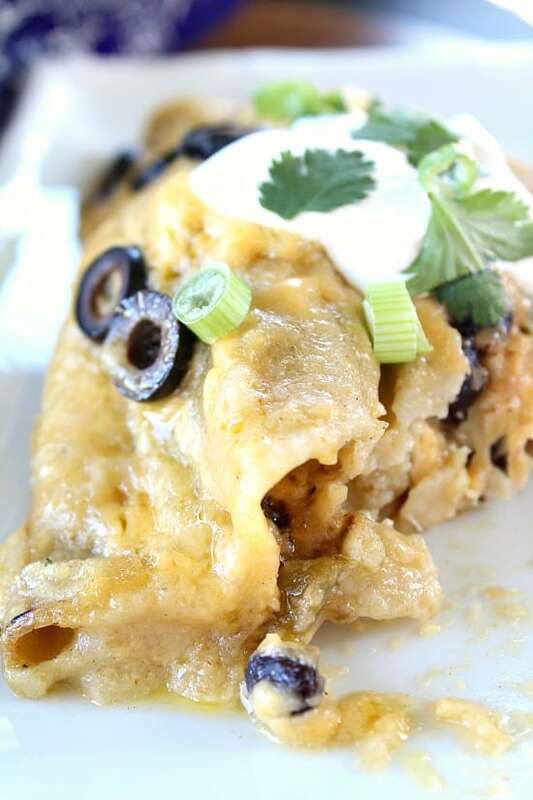 After all tortillas are used, pour remaining green enchilada sauce over the top of all the enchiladas. Sprinkle with the remaining cheese and then top with remaining olives. Cover with foil and bake for 55 minutes or until enchiladas are heated through. Serve with some rice and beans.